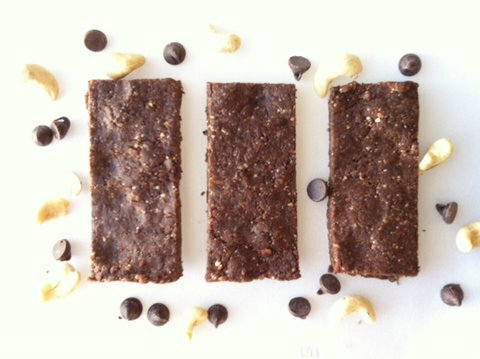 I love, love Larabars because they are made with simple, whole ingredients. But I haven’t been able to afford them lately, due to a tighter budget. They retail for $1.29 a bar in my area and Amazon sells them for $19.99 for a box of 20, making them $1 each. 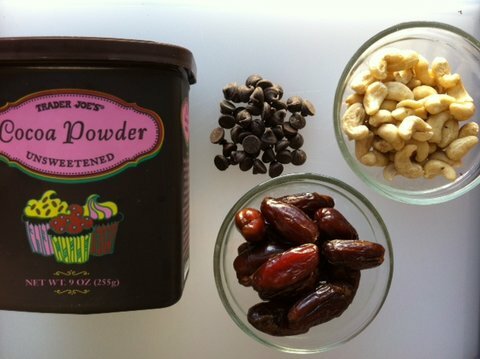 It’s not a bad price for a healthy, whole food snack that’s made with dates, chocolate, and nuts. So when I came across this recipe to make homemade Larabars, I couldn’t wait to try them. Plus, there’s no baking involved! And they’re super easy and quick to make. My 2 1/2 year old daughter even “helped.” Ok, let’s face it – she was more focused on sneaking bites of the blended ingredients when I wasn’t looking! This recipe worked well for my daughter who is dairy-free, gluten-free, peanut-free, and egg yolk-free. Adjust the recipe to your needs. I was able to find pitted dates in the bulk food bin at my local health food store. You can also find pitted dates on Amazon. You’ll need a blender or food processor. I used my Magic Bullet, which got me by when I blended the ingredients in small batches. I do long for a food processor now! All you need to do is add the ingredients into a blender, press into a tray, and place it in the fridge for a few minutes. Then done! I love the taste of these homemade Larabars because they’re not as super sweet as the original Larabars. I will definitely be making these every week. 1. In a blender or food processor, add nuts until blended into a fine texture. 2. Add dates, cocoa powder, and chocolate chips. If the mixture isn’t sticky enough, add a few more dates. 3. Press into a square baking dish, lined with parchment paper. 4. Place into the refrigerator for a few minutes to help it set. The original recipe with variations can be found at The Elliot Homestead.